Tom Boylston is a post-doctoral researcher in social anthropology at the LSE. 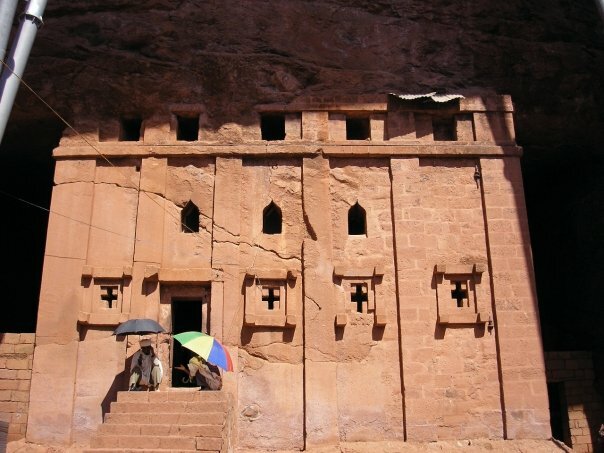 Orthodox priests in Lalibela. Copyright: Tom Boylston. A certain grand narrative of the Ethiopian nation – the Queen of Sheba, the Lion of Judah, the Ark of the Covenant, the bastion of African independence under the guidance of the Christian emperors – retains a great imaginative force both in international discourse and among Ethiopian Orthodox Christians themselves. But the pattern of the last forty years – arguably, of the last century – has been the progressive erosion of Orthodox privilege and Church influence in matters of state. I would like to use this post to reflect on Ethiopian Orthodoxy in post-Imperial times, and to discuss the emergence of a competitive religious public sphere. Orthodox Christians have been challenged to re-evaluate their institutions on multiple fronts, to balance the notions of tradition and territoriality on which their religion is based with multiple competing conceptions of the Ethiopian future, and with the mass perspective shift that global economy, secular government, and narratives of modernity bring about. One useful approach is to ask to what extent a kind of religious marketplace has emerged in contemporary Ethiopia, and to look at the ways in which religious groups attempt to claim space in the public sphere.Orthodox preaching has become a serious public attraction, with touring Orthodox speakers packing out the churchyards of the northern towns for day-long spectaculars of oratory and dancing. New Orthodox hymns have become a key means of spreading religious material among the faithful. In the towns and villages of Amhara, these recorded hymns connect especially with women, allowing them to construct a religiously-oriented domestic sphere and to engage with orthodox discourse in ways that were not possible before. The radio, too, has been an important mode of dissemination of information in the countryside, especially around Easter time. The feasts of Mesqel and Timqet (Exaltation of the Cross and Epiphany) are broadcast on state television, enhancing Orthodox presence in the public sphere, but also critically changing the nature of the events; rituals become spectacles, part of the contest for public space. In the parishes, Sunday school teaching is going strong. Teaching scripture to the laity has become a central plank of Orthodoxy; previously a tacit division of labour saw religious knowledge as the domain of the clergy, while lay Christians expressed their faith through ritual participation and, most importantly, fasting. A democratisation of knowledge is occurring through the spread of media technology but also, I would suggest, as a response to both the secularisation of the state and the success of Protestant missionary methods, which are premised first and foremost upon scriptural discussion. A key question is, how will Orthodox Christians combine the vastly expanded discursive religious sphere with the continuing, definitive importance of the practices of fasting and the performance of the liturgy? The revolution of 1974 was a key moment in Ethiopian Church history, as the state for the first time was declared a secular entity, and theoretically, at least, opposed to religion of any kind. This is the point at which we start to see sweeping changes to Orthodox organisation at grass-roots level. But we can see intimations of the secularisation of state power as early as the reign of Emperor Tewodros (1855-68), and very clearly under Haile Selassie. Haile Selassie brought the Church squarely under state control, and enthusiastically pushed the development of ‘modern’, European style secular education as a counterpart to the Church’s educational structures. In the 1950s, we see some of the first significant changes in the Orthodox Church’s public relations and education practices, with the birth of the Sunday school movement (see footnote 1). Previously, religious education of the laity had not been a significant part of Orthodox practice, but as the Church’s institutional power was undercut, greater efforts were made to engage with and activate the laity at grassroots level. This would become a recurrent pattern in the ensuing decades. So the Derg eviscerated the Orthodox Church hierarchy and replaced them with regime apparatchiks. But little attempt to eradicate Orthodox practice on the ground followed. Rather, seeing the need to win the loyalty of the rural north, the Derg sought to appropriate Orthodox discourse to serve the party’s interests. The Orthodox response was fairly swift – the establishment of parish councils and the revitalisation of local religious structures helped to foster to an increase in religious activity, and in the aftermath of the Red Terror and the failure of the villagisation drives, there was a great uptick in church attendance as people sought shelter and comfort from the political turmoil (see footnote 2). The Derg era also saw the birth of the Mahibere Kidusan, a highly influential activist youth movement in the Orthodox Church, and a significant player in the religious life of the country today. This mobilisation of young Christians, especially university students, has been integral to the Orthodox revival (reform might be a better term, for much of what we are seeing is new) that many observers are witnessing today, with new emphasis on virginity, communion marriage, and strict fasting. The EPRDF era enshrined constitutional religious equality for the first time, and while some would question the degree to which equality has been achieved, the decoupling of Ethiopian Orthodoxy from the national narrative has certainly continued. Perhaps most significant for the Orthodox has been the influx of Protestant missionaries into Orthodox strongholds where previously their activity was banned. The controversial census of 2007 seems to show large numbers of Orthodox Christians converting to Protestantism, which many Orthodox see as by far the most serious threat to the status of their religion. At the same time, the EPRDF has attempted, with some success, to shift national identity politics from a religious to an ethnic framework. One result is that, rather than pursuing influence in government, religious groups shift their attention to attempting to occupy the public sphere – to be seen and heard. The contest over vision and sound is where religious fault lines are now emerging. Part of this is due to a new political economy of conversion. Religions are becoming more like political parties, in that they have to seek to win over wavering members of the public to their side, while activating their support base. As in politics, public relations and an active presence in the public sphere are crucial to success. A significant part of this development is the massive mobilisation of funds from the laity for church building projects across Ethiopia (see footnote 3). Publicity attracts donations, and church building enhances the public presence of Orthodoxy. And as both the Orthodox and others increasingly see the occupation of public space as a key element of their religious activity, church- and mosque- building are becoming key sites of conflict across the country (see footnote 4). It is often noted that Orthodox Christians have much more comfortable relations with Muslims than they do with other Christian groups. Some recent fears of Islamic radicalisation notwithstanding, there remains some truth in this formulation; at least, the Orthodox are not worried about losing converts to Islam in core Christian areas. There may be some signs of increasing tensions, and work is necessary to ensure that competition in the religious public sphere does not degenerate further. But it is Protestantism, alongside the plurality of contemporary economic and mediatic influences, that is proving the strongest drivers of Orthodox transformation. In addition to relations with Islam and Protestantism, the Church must deal with significant internal disputes, New Orthodox sects are emerging, of which the Tehasido movement appears to be the most significant. Based around charismatic healing, the group is accused of heresy and of being a crypto-Pentecostal infiltration. The debate around this new movement is taking place, moreover, through a variety of mass media including the internet. It is easy to find YouTube videos in which Orthodox preachers denounce heretical sects at length, and on the other side, videos of ‘Orthodox’ charismatic healing and exorcism sessions abound. Are we seeing the development of a religious marketplace in Ethiopia? To some extent it seems so. Protestant churches bring with them extensive marketing and public relations skills developed in the global process of missionisation, and thy also frequently bring potent economic networks. As elsewhere, protestant conversion brings for many new economic opportunities, whether through the cultivation of a virtuous work ethic and a rationalised religiosity, or simply through the availability of new global connections and revenue streams. Orthodoxy has had to work hard to activate its religious base and to spread to new converts. The church’s growing engagement with converts among Caribbean populations across the globe is one sign of its new activism. The dispute between Orthodoxy and Protestantism is, I suggest, at heart about mediation. Protestantism preaches direct contact with God, and direct entry into global religious networks. The Tehasido ‘heretics’, likewise, offer a directness of religious contact, and it is this that makes them unacceptable to the Orthodox mainstream, where mediation between God and humans, by saints, Mary, and priests and monks, is a theological necessity. To try to contact God directly is arrogance, tantamount to sacrilege. The recourse to tradition, the importance of fasting, the ritual hierarchy, all speak to a conditioning of the individual will that Protestant churches threaten to short circuit. But media technologies offer a different form of connection among the faithful, a way of disseminating Orthodoxy through new networks while keeping the bodily and disciplinary methods of the Church intact, and even reinforcing them with new vigour. These new networks, I have tried to show, have been developing since at least the 1950s, and they are beginning to address the key question of what a modern Ethiopian Orthodoxy looks like, and what it can be to the Ethiopian state. Ethiopian Orthodox Christianity can no longer claim to be Ethiopia’s default religion, or to hold the cipher key for Ethiopia’s history. But the move to ask what, then, an Ethiopian Orthodox Christianity should be in a global world has been vigorous. The story is not yet complete. (1) See Chaillot, C. 2002 The Ethiopian Orthodox Tewahedo Church Tradition: A Brief Introduction to Its Life and Spirituality. Paris: Inter-Orthodox Dialogue; Larebo, H. M. 1988 “The Ethiopian Orthodox Church.” In Eastern Christianity and Politics in the Twentieth Century. Ed. Pedro Ramet, 375–99. Durham, NC; London: Duke University Press, 1988; Persoon, J. 2004 “Between Ancient Axum and Revolutionary Moscow: The Ethiopian Church in the 20th Century.” In Eastern Christianity: Studies in Modern History, Religion, and Politics.Ed. Anthony O’Mahoney, 160–214. London: Melisende. Once a “governing element” to be reckoned with seriously (according to Perham), the Church has now become the assembly of “regime apparatchiks” (according to this writer). Would she continue to be so? Should she continue to be so? It depends on who answers the question. I would like to add a bit of advice to the writer: respect the rule of science and stay in your region—sociological anthropology or whichever field you are qualified for. Even if you claim to have taken an interdisciplinary approach, you should first have consulted a theologian before you arbitrarily assert anything theological. This I said because nowhere does the Ethiopian Orthodox Tewahedo Church consider “To try to contact God directly [as] arrogance, tantamount to sacrilege.” As far as Ethiopian theology is concerned, no foreign scholar but the late Roger Cowley has ever had an understanding as profound as a scholar should have. They all just take the liberty to make an uninformed guess, and I am afraid, you are one of them. So, please do not pretend to have a profound knowledge of the Ethiopian Church; just keep floating at the surface level. I think you are the first activist of “Tehadiso”. That is why you totally partisan to the success of protestant. Tehadiso is nothing, but protestantism. Ethiopia needs more Protestantism. Deal with it.